A bunch of green berries looks too delectable for a spice. In fact, the temptation is to bite into them. Yield to it, and you will not be able to taste anything all day—the sizzling sensation in the mouth will keep you salivating profusely for hours, as this scribe found at her own cost. That was not a promising introduction to the spice, but in a Goan kitchen the pungent teppal or Sichuan pepper (Zanthoxylum rhetsa) is as indispensable as salt. Without it the signature fish curries of the region would not taste right. In rural Goa, nearly every third household has a tall thorny teppal tree in its backyard. Since just a few berries are enough for a family’s year-round need, one tree keeps several families supplied with enough teppals. 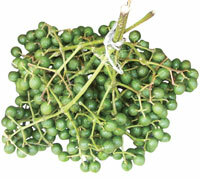 The green berries, also known as triphal, are harvested in August-September, and dried in shade till they split open. The seed is then discarded and the pods are stored. In most dishes, both vegetarian and non-vegetarian, teppal is added either as whole or coarsely pounded when the dish comes to boil or is nearly done. It is important to let the dish sit for at least half an hour. This allows the spice time to release its distinct flavour. Goans mostly use teppal in foods that are difficult to digest—beans, lentils and coconut, for instance. The pepper is said to have digestive and anti-flatulent properties. Ankush Naik, resident of Revona village in South Goa, who showed Down To Earth how to prepare a few teppal dishes, says three to four decades ago, the berry was a household remedy for stomach problems, especially in children. A mild decoction of the fresh or dried pods was administrated in case of colic, diarrhoea, dysentery and constipation. Ulhas Raikar from the neighbouring Kevona village says the Portuguese used to administer the decoction of fresh teppal as enema in case of severe constipation in children and the elderly. “It was also mixed with other ingredients to cure several other ailments, but the recipes were kept secret by the elderly,” he adds. Modern medical research substantiates their beliefs. Researchers with University of Dhaka’s pharmacy department have found antinociceptive and antidiarrhoeal properties in the extract of teppal’s stem bark. Another research by Mae Fah Luang University, Thailand, this year reported anti-bacterial compounds in its root and bark extracts. Soak kokum in warm water for two hours. Squeeze them and strain the extract. Grind coconut into a fine paste along with ginger, garlic, cumin seeds and green chillies. Add enough hot water to the paste to extract milk of desired consistency. Add kokum extract and salt to it. Sol kadhi is ready. Pound teppal pods in a pestle with a little water till the water changes colour. Strain the liquid. Add it to sol kadhi. Mix well. Grind coconut, green chillies, garlic and cumin seeds into a fine paste and keep aside. Heat oil in a pan and add soaked Bengal gram to it. Fry till it turns light brown. Add jackfruit pieces to it. Sprinkle salt and turmeric, and mix well. Cook it covered on a low flame till the ingredients become soft. Add coconut paste to it and cook for a minute or two. Add water as required. Just as the curry comes to boil, add the pounded teppal and kokum fruits to it. Simmer for a few minutes on low flame. Let the curry sit for half an hour so that the flavour of teppal and kokum are infused into it. Serve with rice or chapatti.